Aptamer domain of a guanine riboswitch. Why use two or more molecules when one will do? In our own cells, protein synthesis is controlled by thousands of regulatory proteins, which work together to decide when a particular protein will be made. Bacteria are masters of economy, however, and in some cases, they have figured out a way for messenger RNA to control itself, without the need for help by proteins. Riboswitches are regulatory elements built directly into a messenger RNA. For instance, the riboswitch shown here (PDB entry 1u8d ) senses the level of purine bases, binding tightly to guanine, hypoxanthine and xanthine. This riboswitch is part of the messenger RNA that encodes enzymes that transport and metabolize purines. So, when purine bases are prevalent, they bind to the riboswitch and slow down the production of the proteins when they're not needed. Riboswitches use several tricks to perform their function. First, the folded riboswitch is stabilized by the ligand molecule, so the cell can sense the level of this ligand by seeing if the riboswitch is folded around it. Second, part of the riboswitch is used to control the expression of the messenger RNA. When the small molecule is bound, this "switching" sequence (shown here in pink) is locked in the folded riboswitch. But when the ligand is not available, the switching sequence is released. This switching sequence then typically forms part of an alternative riboswitch conformation that regulates transcription or protein synthesis, enhancing the production of proteins in some cases, and inhibiting it in others. 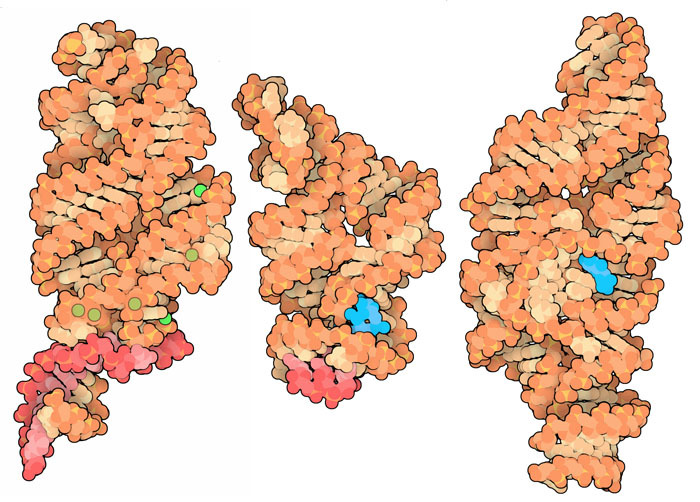 Riboswitch domains that bind to magnesium ions (left), the nucleotide c-di-GMP (center), and glucosamine-6-phosphate (right). Many riboswitches have been found in bacteria, as well as a few in plants and fungi. These sense the levels of many different types of molecules, including purines, amino acids, vitamins, and cofactors. A few unusual examples are shown here. On the left is a riboswitch that senses the levels of magnesium ions, from PDB entry 2qbz . In the center is a riboswitch that senses c-di-GMP (PDB entries 3irw or 3iwn ), a nucleotide molecule that is used as a second messenger the way that cyclic AMP is used in our cells. On the right is a riboswitch that senses the level of glucosamine 6-phosphate, and then turns into a ribozyme that cleaves itself (PDB entry 2z75 ). Riboswitches are remarkably specific for their preferred ligands, rivaling proteins for their strength and selectivity. Two similar riboswitches are shown here, one specific for guanine and the other specific for adenine (PDB entries 1y27 and 1y26 ). They have virtually identical nucleotide sequences, and fold into a virtually identical shape. The nucleotide at position 74 is the key to specificity: it forms a typical Watson-Crick base pair with the ligand, and discriminates between adenine and guanine. 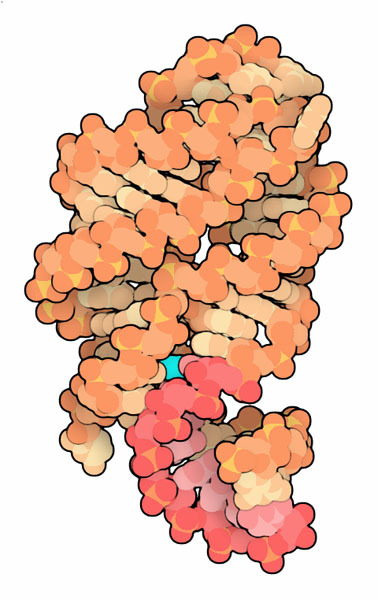 To take a closer look at this base pairing, click on the images here for an interactive Jmol image. There are structures of many different riboswitches in the PDB. Can you find other examples? Riboswitches recognize their ligands using only the four types of bases found in RNA. Try looking closely at these structures to discover how different riboswitches recognize their different ligands. A. Serganov (2009) The long and short of riboswitches. Current Opinion in Structural Biology 19, 251-259. M. D. Dambach and W. C. Winkler (2009) Expanding roles for metabolite-sensing regulatory RNAs. Current Opinion in Microbiology 12, 161-169. R. K. Montange and R. T. Batey (2008) Riboswitches: Emerging themes in RNA structure and function. Annual Review of Biophysics 37, 117-133.